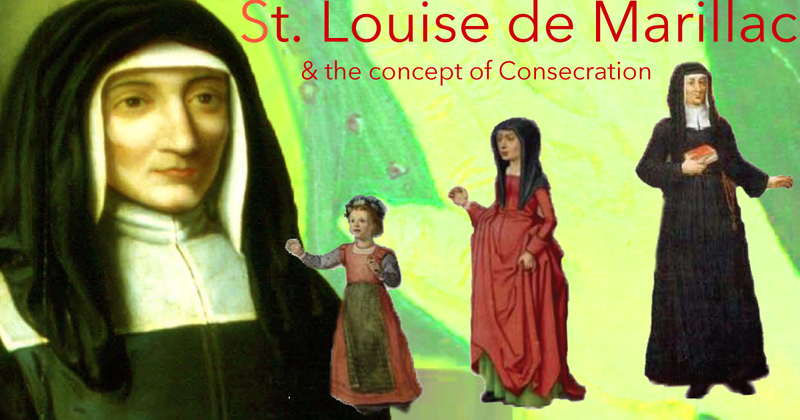 Foundress of the Sisters of Charity of St. Vincent de Paul, born at Paris, 12 August, 1591, daughter of Louis de Marillac, Lord of Ferri res, and Marguerite Le Camus; died there, 15 March, 1660. Her mother having died soon after the birth of Louise, the education of the latter devolved upon her father, a man of blameless life. In her earlier years she was confided to the care of her aunt, a religious at Poissy. Afterwards she studied under a preceptress, devoting much time to the cultivation of the arts. Her father's serious disposition was reflected in the daughter's taste for philosophy and kindred subjects. When about sixteen years old, Louise developed a strong desire to enter the Capuchinesses (Daughter of the Passion). Her spiritual director dissuaded her, however, and her father having died, it became necessary to decide her vocation. Interpreting her director's advice, she accepted the hand of Antoine* Le Gras, a young secretary under Maria de' Medici. A son was born of this marriage on 13 October, 1613, and to his education Mlle Le Gras devoted herself during the years of his childhood. Of works of charity she never wearied. In 1619 she became acquainted with St. Francis de Sales, who was then in Paris, and Mgr. Le Campus, Bishop of Belley, became her spiritual adviser. Troubled by the thought that she had rejected a call to the religious state, she vowed in 1623 not remarry should her husband die before her. M. Le Gras died on 21 December, 1625, after a long illness. In the meantime his wife had made the acquaintance of a priest known as M. Vincent (St. Vincent de Paul), who had been appointed superior of the Visitation Monastery by St. Francis of Sales. She placed herself under his direction, probably early in 1625. His influence led her to associate herself with his work among the poor of Paris, and especially in the extension of the Confrérie de la Charité, an association which he had founded for the relief of the sick poor. It was this labour which decided her life's work, the founding of the Sisters of Charity. The history of the evolution of this institute, which Mlle Le Gras plays so prominent a part, has been given elsewhere (see Charity, Sister of); it suffices here to say that, with formal ecclesiastical and state recognition, Mlle Le Gras' life-work received its assurance of success. Her death occurred in 1660, a few month before the death of St. Vincent, with whose labours she had been so closely united. I well remember them in Glasgow and what they did for so many families... and how 'they formed' the Faith just by their life/the Gospel in action! They had little regard for their own comfort - it was all about a life of giving, serving Christ in the needy with a passion for the poor!